Talk about starting off the new year with a bang. 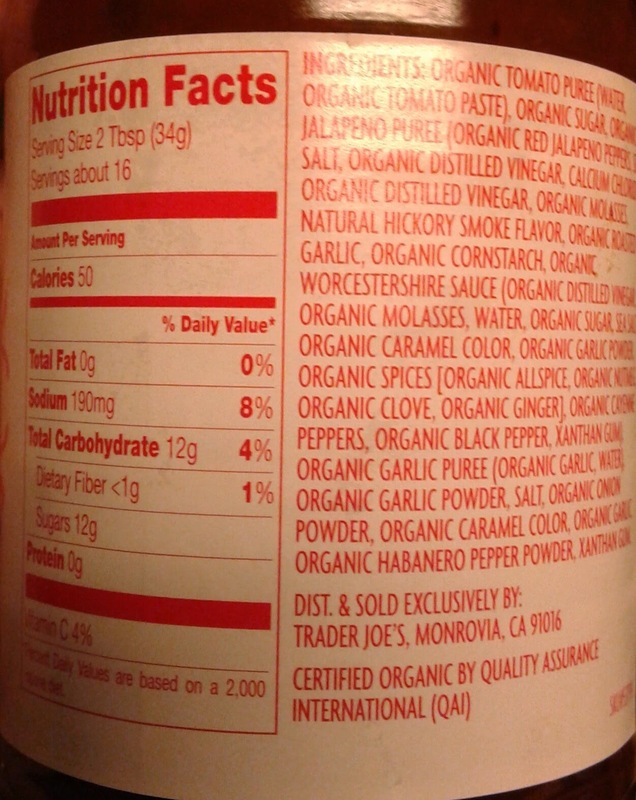 Just look at the name of the newest products to hit the shelves: Trader Joe's Organic Sriracha and Roasted Garlic BBQ Sauce. Daaaang. The first half is uber-hipster-buzzword-happy ("Trader Joe's," "Organic", and "Sriracha") while the second half just promises to be full of flavor. Add the two together, and it sounds like we got the makings of one very potent, very flavorful, very intense condimental companion to your next dinner time. Tastebuds, consider the gauntlet thrown. That is not an understatement. This one very serious, pretty boss sauce. Not any where in my recent memory have I had anything quite like this. There's some burning heat. There's smokiness. Lots of garlic. But even then, there's some tanginess and sweetness that all kind of balls up together in one solid, succinct yet complex flavor wave. It's tough to describe exactly - the first taste starts off relatively sweet enouh, with a little garicky crescendo - must be that roasted garlic goodness. But once the heat hits, it hits - there's no dillydallying here. Habaneros are listed as an active ingredient, after all. Although intense, the spiciness is a somewhat nuanced one, offset by some classic smoky barbeque flavor, with still a little bit more garlic poking through. And naturally there's a lingering hot peppery aftertaste which only grows with each successive bite. As far as consistency, the sriracha barbeque sauce is a good, thicker, goopier kinda of concoction, with little bits of minced garlic floating around. That was a minus for Sandy - it seemed a bit too weird of a textural offset for her. She and I are on our second bottle already. Our first go-around with the sauce was on New Year's Eve, when on a last second audible we switched the plan from grape jelly meatballs to simmering said meatballs in the crockpot all slathered up in this instead. Good call. The time in the slowcooker seemed to cancel out the heat a tad, though, while accentuating the roasted garlic - pretty good, nonetheless, and made the second time a pleasant surprise for its heat and potency. Tasted awesome with chicken, terrific with some peppers and carrots dabbed in, although (probably not suprisingly) not so wonderful with pineapple - the heat, yes, the garlic, no. Something independently propelled both Sandy and I to do that, though, so perhaps we're not too crazy. No question about it: the TJ's sriracha-garlic BBQ is going to end up as a new favorite. It warms our hearts as much as it warms our bellies. Other than the small bits of garlic interfering with an otherwise smooth-as-can-be delivery, there's no complaints here. None. I've seen this but yet to try. Sounds great. Will have implement somehow. Been using General Chao sauce exclusively for my chicken cooking in stir fry and could use a change, even though love that one. I love the giant long ingredient list on TJ products like this with only Xanthan Gum as the weird thing, but all else good stuff. You hit it on your last point - I definitely noticed that as well but neglected to mention! Good call. Great review. I couldn't agree more and am completely addicted to this sauce! Oh this is right up my alley! Two of my favorite things, garlic and sriracha, and in a BBQ sauce...how could this even be wrong. Thanks. By the way, I'm so bummed that Cookie Butter cheesecake is only seasonal and no longer sold : ( I would have stocked up while they had it. Is it more like a traditional smoky BBQ sauce or an Asian condiment? Trying to figure out what kind of meal I would pair it with! We used this sauce on TJ's mini meatballs for the football game yesterday and today I used the rest of the bottle with a chicken breast in a crock pot! Loving this new Trader Joe's product! I really, really, really hope this one lasts the test of Trader Joe's time. It reminds me of Carl's Jr.'s BBQ sauce somehow, which I've been addicted to since I was a kid, only it's better. I've been weaning myself off their BBQ chicken sandwiches (the only healthy thing on their menu) over the last few months and thanks to this post, I can have them again...only via TJ's. I just do their already cooked chicken, I think it's "Just Grilled Chicken", lettuce, tomato and BBQ on a wheat bun and it's 95% the same, but spicier(ish), 10 times cheaper, and probably better for me. Love this site, as I might not of even noticed this sauce on the shelf. This stuff is amazing on burgers. Mix some into the meat and put a schmear on the bun all with some caramelized onions. YUM! Those anyone know if this is a paleo friendly sauce? Try it with a touch of Island Soyaki -- about a 4 to 1 ratio. Hot with a bit of sweet that is to die for. We LOVE this sauce! Made a toe die for meatloaf with it and was extremely impressed. The right amount of sweet, tang, garlic, and spice! My family and friends inhale this stuff. I bought 6 bottles, and 4 were gone in 2-3 weeks ( I entertain a lot in summer) and I swear that one of my sisters snuck one in her purse. The other sister slathers this stuff on dang near everything. I'm thinking of an intervention.